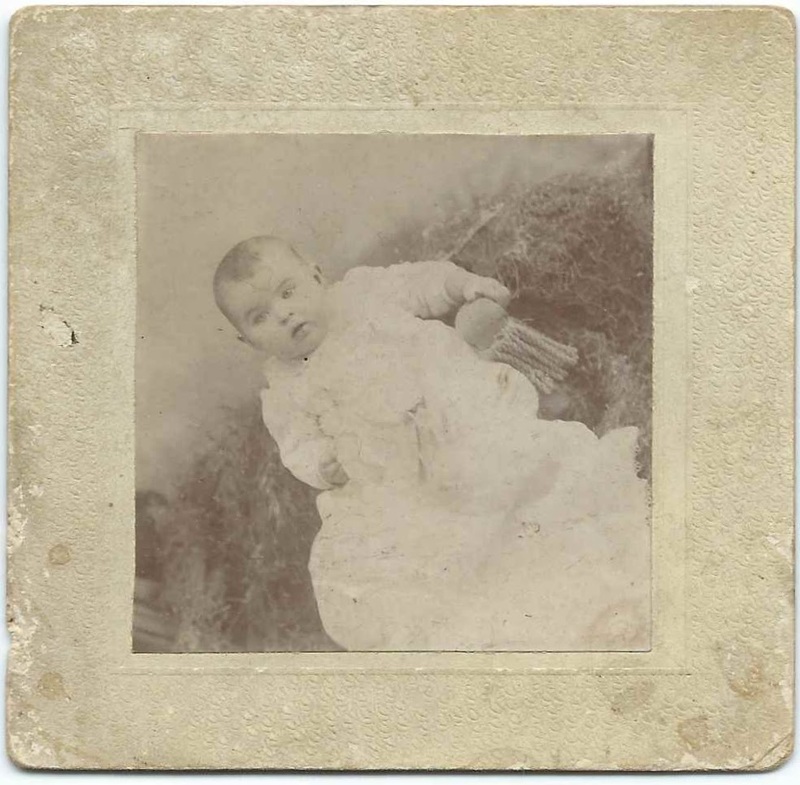 Small photograph of a baby identified on the reverse as Ruth Moran. 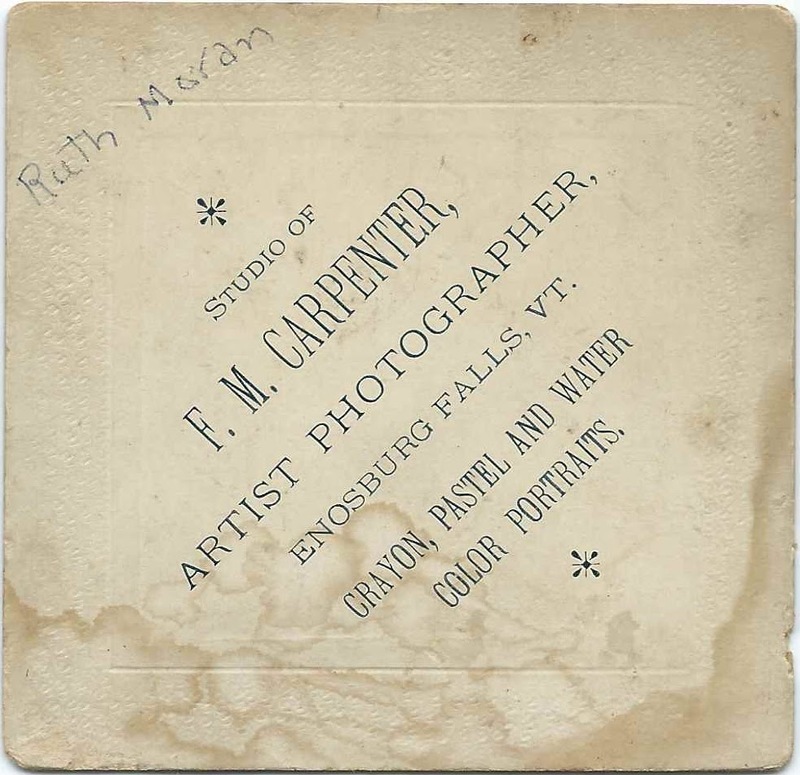 The photograph was taken by the F. M. Carpenter studio at Enosburg Falls, Vermont. Ruth may have been Ruth Frances Moran, born August 16, 1896 at Fairfield, Vermont, daughter of Frank Weston Moran and Katherine (Kelley) Moran. On April 10, 1918 at Fairfield, Vermont, Ruth married James J. [or William] Tracy, son of James William Tracy and Abigail L. (Bolton) Tracy. James J. [or William] was born June 5, 1897 at Enosburg, Vermont. The confusion as to James' middle name comes from conflicting records - his marriage record shows James William Tracy; his death record shows James J. Tracy. Ruth and James raised their family of several children in Vermont. Ruth died in 1968 and James in 1973. They're buried in the North Fairfield-Herrick Cemetery at Enosburg Falls, Vermont. 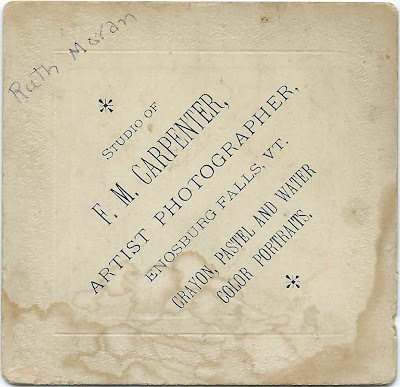 If you have corrections and/or additions to the information above, or if recognize this photograph of another Ruth Moran from your family collection, please leave a comment or contact me directly.